Look for the EC Card or Girocard logo wherever you shop or eat. Photo by Andreas Kreuzer, USAG Bavaria Public Affairs. GRAFENWOEHR, Germany — It’s embarrassing, but it happens. You shop groceries at an off-post grocery store here in Germany. You unload all your groceries at the register and pull out your American credit card. But then, the cashier gives you a blank stare and customers behind you grow impatient. You get the message: Credit cards not accepted here. You can prevent this. Here’s how. Compared to the U.S., credit card usage is relatively low in Germany. Many restaurants, shops and markets in Germany will not accept American credit cards. Some accept but will require a minimum purchase. No worries. You still have an option if you opt not to carry cash. It’s known as the Girocard (and sometimes referred to as the EC card). You can use it to pay for groceries. And you can get one on-post. The Girocard is a debit card connected to your bank account in Germany and is linked to German ATMs (called a “Geldautomat” in German). Germans think of it as electronic cash, which is one reason why it’s still colloquially called the EC card. Unlike a credit card, you will need to have the money in your account to back up your Girocard transaction. The card is accepted at German ATM’s (called a “Geldautomat” in German). Most importantly, you can use it at the grocery store and most restaurants and stores in Germany. Look for the Girocard or Maestro/Cirrus logo wherever you’re looking to spend cash. German banks, however, charge high ATM usage fees from customers using others banks’ ATMs, which is a similar banking practice in the U.S. 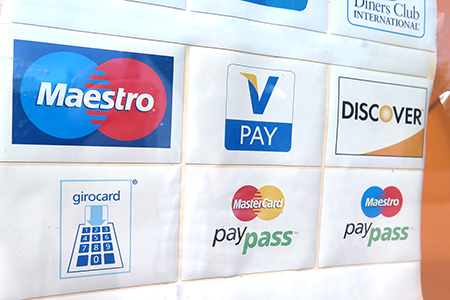 Since the cards are usually co-branded with MasterCard’s Maestro/Cirrus or Visa’s V PAY, you can use the card at almost all ATMs Europe-wide. The cards are issued at German banks. You can get one at either the Service Credit Union or Community Bank, which both have branches on-post at Grafenwoehr, Vilseck, Hohenfels and Garmisch. 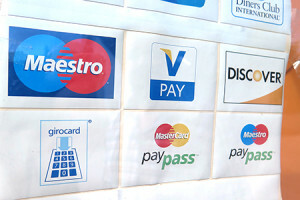 Service Credit Union offers the V PAY card, which can be used like a Girocard, said Aaron Force, a manger at the Service Credit Union at Tower Barracks. V PAY is a new European debit card based on chip and PIN technology, making it safe and secure. It’s accepted by German vendors who accept the EC or Girocard. Look for the EC Card or Girocard logo wherever you shop or eat. Community Bank offers the Visa debit card, which can be used in the U.S. and in Europe, said Clemens Hellebrand, a manager at the Community Bank on Rose Barracks. It can be used like a Girocard with latest chip and PIN technology. Just remember, because both the V PAY card and Visa card are debit cards, you’ll need to have the cash in your account before you buy anything. You can check your account balance at the ATM.